November | 2008 | FreshTech. I keep seeing this question pop up, so let me take the liberty to address it. Can you use Kindle overseas? The answer is yes and no. Yes. if you plan to “load up” before you leave or download all your content with USB cable while overseas and no, if you plan to use wireless whispernet while there. Quite frankly, the wireless whispernet technology is not available in international countries for various reasons. But that of course only limit your kindle usage if you are trying to get your content wirelessly while there. You can, however, use the old USB – Kindle-Computer connection to get around the problem. All you need to do is get access to a computer while there and follow the procedure. You can also get your content from the Kindle Store or from other compatible sources. There is a lot of free content out there that conform to the format requirement and is not restricted by DRM rights…you just have to know where to look. Perhaps an even smarter option is to “load” up before you leave. Get all the content you think you will be able to read depending on the amount of time you plan to stay. Of course if you plan to stay “forever,” that’s another story…After all, Kindle do hold up to 200 books and magazine in RAM…and that should hold you for quite a while. Everything I said so far is good as long you are planning to read content that’s accessible via Amazon…and from other compatible sources. There are a lot of Kindle support . POLL:2ND GENERATION KINDLE WISH LIST. Touch and hold any of the Home screen icons until it starts to wiggle. Drag the icon to where you want to place it on the screen. Press the Home button to fix and save the new arrangement. Create additional Home screens by dragging an icon to the right edge of the screen until a new screen appears. Return to the original screen by flicking back, then drag additional icons to the new screen. – You can create a total of up to nine screens. The number of dots above the Dock is equal to the number of Home screens you have created. The hi-lighted dock tells you which Home screen you are on. – Also, Instead of flicking (to the left or right) to switch Home screens, you can tap to the left or to the right of the row of dots above the Dock. The following is a detailed comparison between kindle and the PRS-700BC. Interactive touch screen allows you to turn pages by sliding finger across the screen, activate bookmark, create annotations with a virtual keyboard, highlight text with a stylus pen, and search for text. Built-in LED reading light allows night reading. From the PC you download selected content into your PRS-700BC. Use USB cable to transfer content from your computer to the device. More than 190,000 books available, including more than 95 of 112 current New York Times® Best Sellers and all New Releases $9.99, unless marked otherwise. 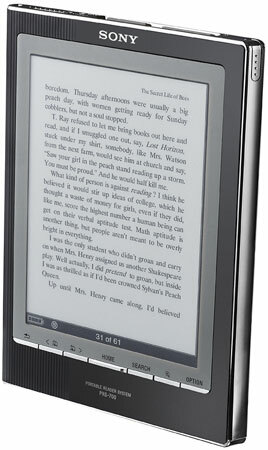 Screen: Sony is better – 8 level gray scale, interactive touch screen, LED reading light as opposed to Kindle’s 6 level gray scale and no interactive touch screen. Capacity: PRS-700BC holds 350 titles in internal memory, Kindle holds 200. 6.0-inch Interactive Touch Screen Display – same size as the PRS-505, but with interactive touch screen that allows you to turn pages by sliding your finger across the screen, activate bookmark, create annotations with a virtual keyboard, highlight text with a stylus pen, search for text, adjust the font size between 5 levels – (PRS-505) has no touch screen and only 3 font levels. Faster Processor, quicker response times when opening content or turning pages. Holds about 350 digital books in RAM – PRS 505 holds 160. Built-in LED reading light gives you the ability to read in the dark – PRS 505 had none. Make annotations virtual keyboard. Highlight text with a stylus pen or touch of your finger. search for text with the virtual keyboard or by highlighting text – PRS-505 has no virtual keyboard or touch screen. search, browse, discover, and buy new releases, classics, and popular digital book titles from The eBook Store and participating Websites. DRM Free eBooks in file formats supported by the Reader – same with PRS-505. eBook Library 2.5 PC Software. transfer Adobe® PDF documents , Microsoft® Word documents, BBeB® format, and other text file formats to the Reader – PRS 505 uses 2.0 PC Software. supports EPUB/ADEPT and connection with Adobe Digital Editions. You can even play back unsecured MP3s and AAC audio files – PRS 505 does not support EPUB/ADEPT. Unsecured Text : BBeB, ePub, TXT, RTF, Adobe® PDF, Microsoft® Word – PRS 505 no ePub. The Price is Right but what’s the Catch? I always wanted an iPhone, but was not willing to pay $400 for it. So when the price dropped to $199, I thought it was the perfect time to buy…my goal? To see if this much talked about device would live up to the hype. All those captivating features: touch-scroll-zoom-rotating screen, music, video, internet browsing, email access, navigation system, scrolling contact list, etc., do they really work? There was only one way to find out…get one. The timing was right and the price ($199) made sense…so for me it was time to buy. I logged on to Apple.com , credit card in hand, ready to buy only to be redirected to an Apple retail store (AT&T Store). Apparently AT&T have some kind of agreement with Apple which gives them the right to be the sole distributor of the iPhone in the US…bomber! they have Monopolized the darn iPhone! I mean there is no other mobile phone distributor in the country authorized to sell the iPhone…AT&T have completely decimated the competition. Can you believe it? I couldn’t. Yes, you may be able to get an iPhone (probably unlocked) at Ebay.com, but at what price?…and What does this mean for the customer? it meant they have very few choices. Whatever AT&T throws at them, they have to accept. I was furious, but still went to get one at a nearby retail outlet. Since I wasn’t expecting my monthly cost to be that high so fast, I made the decision to either keep the iphone and pay a high monthly bill, or return it, wait out the Monopoly, and get another at a later date. I chose the latter. I kept the iPhone for a month, tried out all the features then returned it. I have to admit, it is a really nice phone with some awesome features. I loved it. I have tried a few imitations including CECT 168 and it doesn’t even come close. Getting rid of the iPhone was really hard for me. There is absolutely no doubt in my mind that this phone re-define mobile phones and is worth having at the right price. At this point, I will wait a while and see what happens…I know I may be waiting for a while because AT&T is going to milk this cash cow for all it’s worth before the competition comes in…but I have time. In the meantime, I will consider other options. Perhaps I will travel overseas and get one that is unlocked. Several other countries offer the iPhone with less restrictions. AT&T’s tentacles are too short to reach beyond the boundaries of US soil. As of now, I have learned what I need to know about this phone firsthand. If future upgrades occur that’s worthy of my attention, I will get my hand on another. That said, If you decide to get one now, I would say, “go ahead.” Just be willing to pay the price. Digital Text Platform brings self-publishing to your fingertips. You can quickly upload your digital content, submit your sales copy, enter pricing information, and publish your content. Your content becomes available almost immediately at the Kindle Store and you have immediate access to thousands of kindle customers who can purchase , download , and start reading. your content immediately. All the business, marketing, and vendor support you need to optimize your sales is provided right there at the Kindle Store. Titles published at the store are eligible for automated merchandising and personalization, Amazon.com’s excellent Customer Service and order fulfillment services. As a Publisher You Set Your Own “list Price” for Content. You are allowed to set the retail price for your content. Amazon.com reserves the right to set the price at their own discretion, but until they exercise that right, pricing is within your power. You will be paid a set percentage of the list price in line with terms and conditions. From time to time, Amazon may offer your product to customers at a discounted price. This will not affect your earning percentage even if they change your retail price. Amazon’s decision to discount products is based on a number of considerations which may vary from time to time. Hundreds of thousands of items are offered at discounted price at Amazon every day. If for some reason a customer is not satisfied with your product, the kindle store offers a refund within seven days of purchase. You don’t ever have to deal with a customer yourself. Refunds will appear as a negative transaction on your transaction report, and will be subtracted from your account balance. Each month Amazon will pay you via electronic funds deposited directly into your bank account. You just need to supply your banking information to them. If for some reason your banking information changes over time, you can easily update it on the Amazon.com website so that you can continue to be paid. You will also need to pay taxes on the income you get from your sales. So, federal law requires that you submit your personal information for that purpose.